At GeoTec 2007 in Calgary Alberta GeoTec Media announced the winners of its inaugural Geospatial Leadership Awards . This is a new awards program that was "created to identify and recognize individuals and organizations for both vision and achievement in the geospatial industry." MapGuide Open Source was selected for the Geospatial Innovator Award. 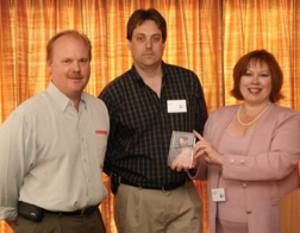 That's Bob Bray, technical architect of MapGuide Open Source, in the middle who accepted on behalf of the Autodesk team. In the US digital spatial data collected at taxpayer expense is available from the Federal government at no cost. The best known example is the TIGER/Line (R) files, which comprise a digital database of geographic features, such as roads and streets including street numbers, railroads, rivers, lakes, legal boundaries, and census statistical boundaries covering the entire United States, see TIGER . These data files can be freely downloaded with the only apparent restriction being that the Census Bureau has trademarks on several TIGER(R)-related product names. The purpose of trademarking is not to restrict reuse of TIGER(R) data even in commercial derivative products, for example simply reselling exact copies of the data in a pretty box, but so that customers buying products with those names can be confident of the origin of the data being sold. At the state, county, and municipal level the situation is not so clearcut. For example, in California the California Public Records Act (CPRA) requires that state and local government records should be accessible to anyone requesting them for no more than the cost of duplication. But there has been disagreement as to whether this act applies to spatial data, specifically, parcel basemaps maintained by the 58 counties in California. Apparently until recently, 21 of California's 58 counties sold their digital parcel basemap data at higher prices than the cost of copying. The Attorney General of California issued an official opinion to the effect that digital parcel data is covered by the CPRA, which convinced eight more counties to make their digital parcel data available for free or at nominal cost. That left 13 counties who continued to maintain a high cost spatial data distribution policy. The California First Amendment Coalition (CFAC) took one of the counties to court after the county denied CFAC's request for the county's parcel basemap data at the cost of copying. The California Superior Court for Santa Clara County supported CFAC and directed the county to provide the parcel basemap data to CFAC charging only for the cost of duplication. This means that in California there is now a legal precedent supporting the application of the CPRA to spatial data. In other words in California access to spatial "information concerning the conduct of the people's business is a fundamental and necessary right of every person in this state." I just spent two days at a remarkable conference in Toronto. The conference was a joint effort of the Canadian Institute of Geomatics and the ISPRS. It was very well attended, primarily by Canadians, but with with wide representation from all over the world, especially China. If you are interested in disaster management, there were over a hundred presentations and poster sessions on this subject. The Canadian Institute of Geomatics, one of the organizers of the event is quite a remarkable organization. It has over 1000 members and subscribers worldwide and this year is celebrating its 125th anniversary. Its executive director is Jean Thie, a pioneer in so many aspects of geomatics, who among many other things was responsible for implementing the world's first operational geographic information system (GIS), the Canadian Geographic Information System (CGIS), when he was with the Canadian Land Inventory (CLI). If I remember, it was implemented on an IBM3 60 in 360 Assembler. The Canada Land Inventory was designed in the late 1960's and implemented between 1967 and 1977. In its lifetime over 15,000 capability maps were produced and it remains one of the largest digital sources of multi-disciplinary information for most of the settled portion of Canada, an area of approximately 2.5 million sq km. This Federal-Provincial Inventory Program was a massive undertaking especially given the computing tools available at the time it was developed and was the reason for the development of CGIS. The CLI is available online Canadian Land Inventory at the Geogratis web site of Natural Resources Canada. On the subject of geospatial data in Canada, a remarkable event occurred in April of this year. As of April 1st 2007, Natural Resources Canada (NRCan) has changed the way that Digital Topographic Data (DTD) can be accessed. NRCan is making its existing DTD products available through the Geogratis Web Portal and users now have no fee access to DTD products, commercial licenses will no longer be required, and users have rights for unlimited use and royalty free distribution of the data through a single unrestricted use license agreement. Effectively, this means that in Canada most government geospatial data is now available at no cost and with an unrestricted license. What a milestone ! I know my friend Giulio Maffini and many others in Canada will feel highly gratified, though Giulio would have preferred that this would have happened 20 years ago. I have been in Hobart , Tasmania this week at the Spatial Sciences Institute Biennial International Conference. This is the second time I have been to a SSI conference and I have found these events to be very worthwhile. This year has been exceptional and I want to tell you about an absolutely fascinating Workshop that I attended Monday. The title represents an accurate precis of what the workshop covered. It was presented by Tim Barker and Neale Hooper, of the Queensland Treasury, which is part of the government of the State of Queensland. Neale is a crown lawyer with private experience and who has specialized in intellectual property (IP) rights and Tim is a statistician. They have been assisted by Dr Anne Fitzgerald, who is also a lawyer. Their objective has been to develop a standard set of licenses for the Government of Queensland to be used for digital spatial data including in an online environment. The widely quoted statistic is that 80% of government information has a geospatial dimension, so this will have major impact on the availability and dissemination of government information. Their primary audience is government and focusses on intragovernment sharing of spatial data. By standardizing a legal framework for sharing information, they hope to help manage govt IP, standardize information licensing, improve access to information, and reduce risk. Standard licensing will be comprised of standard set of terms, be both effective and legal, fit into the national and international recognized environments, and provide an attractive environment for private sector investment. The effort is part of the Queensland Spatial Information Council's Smart geospatial solutions for Queensland that involves local government, the federal government, the education sector, and the private sector. They touched on pricing policy but that is not what this workshop was about. Copyright in Australia is different from copyright in the US. An interesting example is that in the US telephone book White Pages are not copyrightable, while in Australia they are. Copyright is automatic in Australia and in Australia there is the concept of Crown copyright, which means that material originating from a government employee in the normal course of his or her duties, is automatically copyrighted by the government. This includes spatial data. A really intriguing thing is that apparently this is not the case under US copyright law, so that, for example, the US Census' T IGER data, which is freely down loadable, is not copyrighted. The problem in Queensland, and I gather in the rest of Australia, is that there are no standard licenses, so that government agencies are not aware of what their legal rights are when they want to reuse another agency's data. For example, it is uncertain if they can create a derivative work incorporating another agency's data or whether their data can be used for commercial purposes. 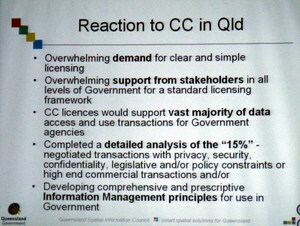 What is being recommended in Queensland is that all government spatial data would be available under Creative Commons (CC) licenses. CC represents a set of six licenses that protect the IP rights of data creators while encouraging sharing and re-use. Licenses are interoperable, minimize administration and can be applied to any media. It should also be borne in mind, that just as with open source software, there is always an opportunity for dual licensing. The intention is that all Queensland Government data will be released with at least an attribution license, so that all spatial data files will contain a a copyright statement. This is possible in Australia because copyright is automatic and because government data is covered by Crown copyright. In the US, in contrast, data emanating from the Federal Government apparently does not have copyright, which creates a problem. 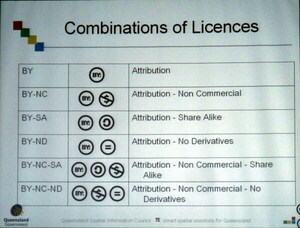 Creative Commons licenses are widely used, and both Google and Yahoo support searches for CC licensed material. Interestingly apparently the Bill and Melinda Gates Foundation requires Creative Commons licenses in the context of the AIDS research that the Foundation supports. Neale and Tim reported that their recommendation is getting a lot of support within the Queensland government as well as b y the private sector. I would think that their ground-breaking research and recommendations will get a lot of attention nationally in Australia and even more attention worldwide. I find it intriguing that the issue of copyrighting government data hasn't received a lot more attention than it has. I think that this issue has much wider implications than many people imagine. 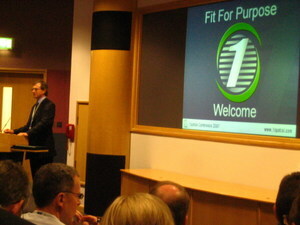 The 1Spatial Conference took place this year at the Ordnance survey in Southampton. It was an outstanding conference in many ways, one of which was the weather, which was brilliant. I must admit that on previous visits to Southampton I experienced what most people expect on the UK seacoast. The other aspect of the conference that made it outstanding were the folks who attended. There were barely enough seats in the main auditorium in the OS business centre. In was great to see so many people that I hadn't seen for a while including all the folks from 1Spatial, Mike Sanderson, Steven Ramage, Chris Wright, Graham Stickler, Paul Watson, and Chris Tagg. I was pleasantly surprised to see Ed Parsons, now of Google, Ed Riegelmann from CH2MHill, Kevin Challen from Infotech, Faisal Al-Tamimi from Saudi Arabia, Peter ter Haar, Graham Vowles, and Carsten Roensdorf from the OS, Peter Mahan from United Utilities, David Miller from eSpatial, John Hartshorn from Bentley, and many others. And there were many folks that I met for the first time. In fact there were so many interesting folks to chat with that it was hard to find time to go to the sessions. I did manage to hear Ed Parson's very interesting talk about Google and what Google was doing. Ed was with the OS until the end of year and just joined Google a month ago or so. Ed always has an interesting perspective on things which you can experience yourself on his blog. A talk that I also enjoyed was Ed Riegelmann's presentation on the SDSFIE standard. If you are not familiar with SDSFIE it is the only really open infrastructure data content standard (it's actually an ANSI standard) and is designed for use with standard commercial CAD and GIS packages. It's basically a set of infrastructure data models originally designed for military bases (DoD), but because it is nonproprietary it has been adopted in other sectors such as other Federal, State, and local government organizations; public utilities mostly in the US, but it appears to be showing up outside of the US as well. It used to be run out of a US Army CAD/GIS centre in Vicksburg and the name I have always associated with it is Harold Smith. I was uncertain what would happen to SDSFIE after Harold's departure from Vicksburg, and Ed's talk alerted me that appears to be new life in SDSFIE. The "new SDSFIE" has a new web site, which is no longer a .MIL site. The SDSFIE Steering Group has set itself some new and interesting goals including creating a DoD standard for facilities, infrastructure, environment, and civil works. It will be interesting to see to what extent non-DoD folks will be encouraged to participate in the process to define a new logical data model. It will also be interesting to see how SDSFIE relates to the various BIM, CAD and geospatial standards from the IAI, OGC, and NBIM committee. There appears to be an opportunity for input from the community so I would encourage folks who have used SDSFIE data models in the past or who are interested in open data models to take a look at the new SDSFIE site.